Ventaglio was conceived in Italy, and made out Italian raw materials. It offers the perfect combination of craftsmanship and quality. 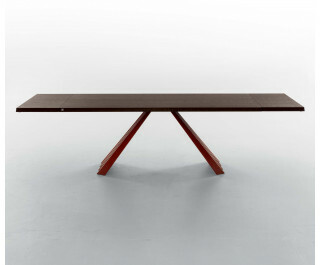 The curved metal legs, main characteristic of this table, can be varnished with different colors. Glass, tempered glass and wooden tops are available, both fixed and extendible. Uncover the elegance of its design with the extendible, wooden version. Solid wood provides further endurance and beauty: a whole board, warm and resistant, elegant and classic, standing out, above the contemporary base.